I have put the book reviews aside for a single post because I wanted to ask for some information from anyone who lives in the UK and who enjoys browsing through secondhand book shops, charity stores, and markets. It has occurred to me lately that I need to take a break from my studies. I have a fascinating PhD topic, a small part of the research effort focused on understanding how HIV-1 mutates in response to the immune system of the person it has infected, but I am sure boredom is the enemy of anyone attempting to write a thesis. I need to escape from it for a while. My husband has very kindly offered to relieve me of my responsibilities for a few weeks early next year, and suggested that I hop on a plane to the UK and spend a few weeks wandering about in the villages of England or the suburbs of London continuing the search for Penguins to add to the collection. I know it would probably be cheaper to sit here at the computer in Perth and buy them through ebay, but I wouldn't enjoy it nearly as much. 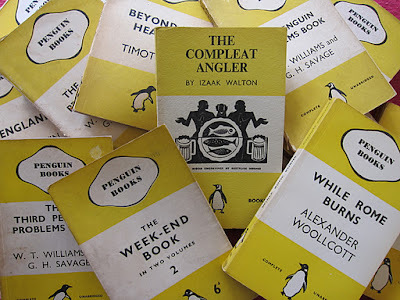 In the past I have relied on serendipity to help me find bookshops stocked with vintage Penguins, and I like to think that I have been very fortunate. The moments when I stumbled across them on holiday will never be forgotten, and yet I remember the exact details so vaguely: there was a bookshop in Arundel, another below the pavement in Edinburgh (possibly in Leith Walk? ), a charity store open on a Sunday afternoon in Oxford (perhaps on the Cowley Rd), an antique store in Castle Cary, and a market stall in Spitalfields market on a Sunday morning. And then there are the Oxfam stores: I found my first ever copy of Ariel in Kentish Town, and I love to walk the streets of Hampstead, through the churchyard of St John-at-Hampstead, ending up at the charity stores in West End Lane. Unfortunately relying on chance doesn't always work. 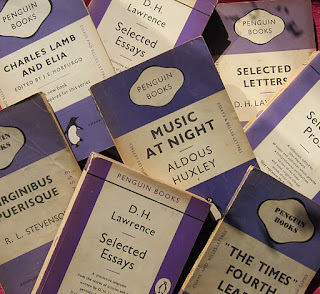 A few weeks after I returned from a family holiday that involved a lovely stay in the village of Frome, Yvonne of Fiction Books left a comment on this blog about a wonderful book store near Bath stocked with hundreds old Penguins. I must have only been a few miles away and yet I never found it. So this time I'm asking for help before I go. I haven't settled on an itinerary yet, or even a time to go, although it will probably be in winter in order to avoid the crowds. Perhaps I will spend a few days in Amsterdam, catch the ferry to Newcastle, and then take a train to Liverpool. There are places near Liverpool that I would love to visit: Chester, Llandudno, possibly Portmeirion if I can work out how to get there on my own and without a car. Then to Lyme Regis, because the last two times I have tried to go there I have been prevented by snow, Oxford, and then London. If you have any advice or recommendations, I would love to hear them. Is there any village I should particularly head to? Any shop that I shouldn't miss? 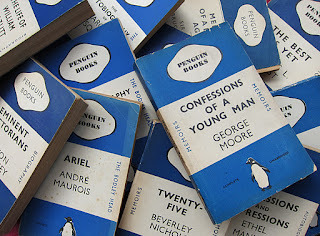 If you have seen a stash of old Penguins for sale anywhere in the UK I would love to know. I just wanted to thank everyone who left a message in the comments below, or who contacted me by email or by twitter. When I get some time over the weekend I plan to sit here at the computer with google maps and a train/bus schedule and work out where all these places are, and see what is feasible. Having journeyed by car last year in the UK and seen the havoc caused by the snow and black ice, and dealt with the roundabouts, and the parking (though only as a passenger), I know that hiring a car would be far too stressful. In Western Australia country roads tend to be long, straight, wide, and empty. In case anyone else is interested, the other suggestions that I have received which are not listed below are: Joel Segal in Exeter, Adelphi Books in Portsmouth, Book Cupboard in Plymouth, Charing Cross Rd in London, Scoob in London, and the mystery novel shop in Hay-on-Wye, courtesy of @CAPittard, @timesflow, @SimonTateBooks, and @detectivecritic on twitter. Sarah, my email address is karynreevesATgmail.com. Simon, you are just lovely, and I would like nothing more than to come and say hello when I am in Oxford. How exciting! I stumbled upon a book shop/gift shop in Oxford when visiting this past September. It had stacks of Penguins but frustratingly for me they were all wrapped in plastic. Anyway, the name of the place escapes me but do ask StuckInABook. what about Hay on Wye, the village full of bookshops? I don't know about penguins specifically, but it is a big concentration of 2nd hand bookshops. You could try The Londonist blog for info about London bookshops. Maybe the way to do it is to have your trip coincide with one of the big literary festivals eg Cheltenham, Hay on Wye or Edinburgh book festival? In general, I am afraid you will find that there are far fewer second hand (or any) bookshops in the UK than on your last visit - though there are good Oxfam bookshops, maybe there is a listing on their website. It is quite easy getting around by train but it is expensive - it is cheaper the earlier you book. You might also want to check out coach travel between main cities which is a lot cheaper and is pretty fast. Hay on Wye is the place for bookshops with shelves and shelves of second hand books in what seems like dozens of bookshops. If you wanted to take a route such as Chester, Llandudno, Portmeirion, HAY ON WYE, Bath, Frome, Totnes [another good place for second hand books] and Lyme Regis you would probably need a car or you would spend ages on buses. But the one place you should not miss is Hay on Wye. Hello Karyn. That's quite an itinerary you have planned in the UK! As a general rule the orange penguins are much easier to find in 2nd hand books shops than the green crime ones although it is possible ot pick them up too. If you can get to Buxton there is a wonderful bookshop here called Scriveners. It really is one of a kind. It has a website here: www.scrivenersbooks.co.uk and was named as one of The The Guardian's top 10 second hand bookshops here: http://www.guardian.co.uk/books/gallery/2009/oct/02/secondhand-bookshops I have too much info for a single post - there are other places I can recommend. Can you give me an e-mail address or contact me direct though my blog? Incidentally I have a duplicate penguin crime book that I see you don't have and Ihave been meaning to send it to you. Again, if you drop me a line with your address I will stick it in the post. There's a small stash in my local used bookshop - Newlyn Books in Penzance - but in general I don't find many numbered Penguins in the far south-west. Just the odd book here and there. Good luck on your quest! If you end up in Edinburgh you should visit the Stockbridge part which has several charity/second-hand bookshops. English town markets can be a good source too but you have to find out their market day. On a recent trip I bought s/h books in Lincoln,Saffron Walden, Cambridge and Moffat(Scotland). I hope you have a great time! However, it is worth phoning them because the opening hours are a tad erratic, especially out of season. But I would particularly recommend the bookshop on the Marine Parade, it's splendid. I hope you enjoy your trip and find some great books! Oh, Karyn, do come to Oxford and say hello to me! The bookshop/giftshop Darlene mentioned is Arcadia - it's lovely, and does indeed have a fair number of Penguins, but not huge amounts. The Cowley Road bookshop you visited is now a hairdresser, sadly. My local bookshop in Crewkerne, Somerset has a bookcase or two of Penguins, but that isn't an uncommon sight in bookshops here. Wracking my brains now... Arcadia would definitely be your best bet in Oxford. Shamefully I don't know that much about the best bookshops in London - just the ones I always revisit. Thanks for the info about bookshops in Lyme Regis, Midsomer Norton and Crewkerne [my wife used to live there]. You say your Ph.D. is "focused on understanding how HIV-1 mutates in response to the immune system of the person it has infected." This doesn't seem like a question a statistician could answer, even theoretically, or do I misunderstand the nature of your work? As for helping you capture new penguins, I support it heartily but, alas, only know used bookstores in San Jose, Berkeley, San Francisco, and other literary backwaters in California. I'm always searching for you, just so you know. It is difficult to discuss statistics and make it sound interesting, but I will try. At Ph.D. level a statistician is looking at developing statistical techniques that anyone can apply to a dataset in order to find a pattern, and to separate signal from noise. In the case I'm working on there are thousands of possible candidates for experimental investigation, and because budgets are limited they need to select which ones to focus on, and that is a statistical problem - working out which associations between mutation in the viral sequence and alleles carried by the individuals infected are more likely to be indicative of a real effect, and which ones are probably due to chance or confounding. The underlying problem - the association between HIV-1 viral mutation and the HLA alleles carried by an individual host - is a fascinating story. HIV-1 mutates at an astonishing rate and basically evolves within each infected person to evade the defences of the immune system. Everyone has a different immune system, determined by the mix of alleles inherited at birth, and in the days before drug therapies existed HIV prognosis was partly determined by which alleles were carried. Understanding why might help in the development of a vaccine, and that is really the only long term hope for controlling the pandemic. I hope that explanation made some sense. I'm no natural mathematician; I studied statistics in order to be involved in medical research. And I am very touched by the idea that you might be thinking of me when you are browsing through book stores. I've recently bought old Penguins in Black Gull Books (East Finchley, London N2 - the other branch is at Camden Lock, London NW1) and Brighton Books in Kensington Gardens, North Laines, Brighton. The former you could combine with a visit to the biggest cemetery in London, an atmospheric Victorian affair; and the latter with a bus ride to the village of Rottingdean, home of numerous writers from the past. I suggest you visit the Village Bookshop in Penn, not least for its selection of old Penguins but for its olde worlde charm and the fact that its shelves are stacked floor to ceiling and typifies what a second hand bookshop should be like. I regularly enhance my collection of Penguins and Pelicans from there. 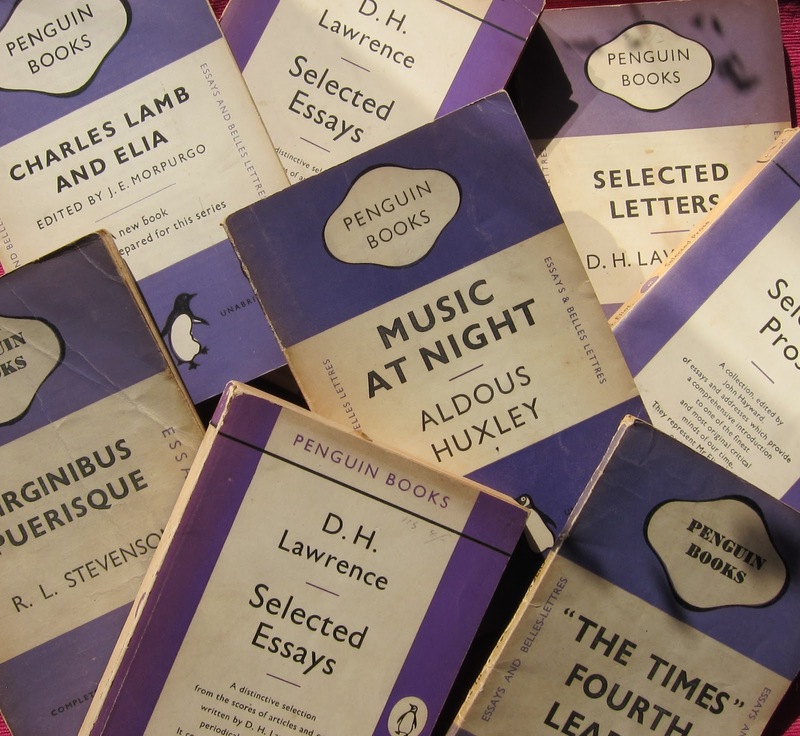 Are you a member of the Penguin Collectors Society? I was at Bay Books in Colwyn Bay, on the North Wales coast just east of Llandudno, last March and they had a pretty decent range of old penguins in their own section (I got #666). I run a small gallery and specialist bookshop called Tivoli on Waiheke Island 35 mins ferry from Auckland New Zealand. We specialise in Vintage Penguins and had an exhibition of Penguin books / design this year. Click on exhibits then 'welcome to the Penguinery' on the Tivoli home page. Tivolinz.com Nearer to home for you? !